emily lam | blog: I'm ADDICTED to awkward!!! Today has been a good day - okay, it would be better if I finished my outline for WR 100 but I still have time. Anyways, I went to the goodwill store for the first time! It was so interesting. They had really kooL stuff there, like records and cassettes and VHS tapes. I'm so disappointed in myself for never going into a goodwill store until now. My floormates and I also went into a gaming store and they had ALL sorts of board games! It was equally amazing as the goodwill store. 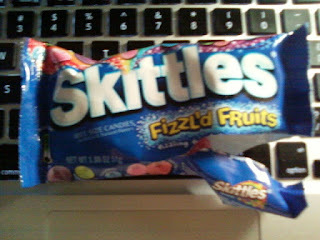 And finally, I bought Skittles Fizzl'd Fruits, for the second time!